Follow the step-by-step Bablic X Wordpress integration tutorial below and achieve complete Wordpress localization within minutes. Yes, minutes. Start by clicking on "Plugins" and then "Add New" from your Wordpress admin panel as pictured below. Continue by searching for "Bablic Localization" in the search field, as seen in the screenshot below. Click on "Install Now" as seen below. Now that you've downloaded and installed the plugin, it's finally time to activate it. Click on "Activate Plugin" - just like you see in the screenshot right below. It's now time to play with the Bablic Wordpress Localization plugin settings. 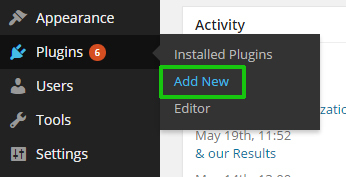 Let's head back to the Plugins section in your Wordpress dashboard and find the Bablic plugin, then click on "Settings" - exactly as you see below in the detailed image. Finally, the last step is to just click "I'm new to Bablic", if you want to start from scratch. In case you have already started with Bablic, click "I already have an account". You'll now be in the Bablic Localization editor which will allow you to choose from machine or professional human translation, add more languages, manually edit elements (text, images, CSS) just by right-clicking on them and more features. If you need any help translating Wordpress using Bablic simply email [email protected] - we're here to help. 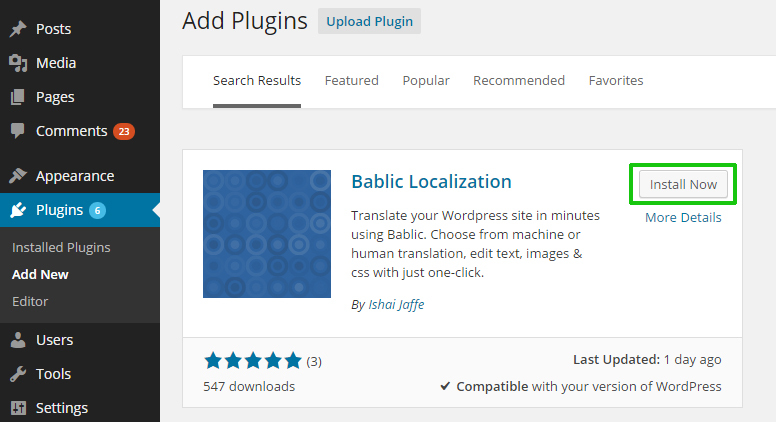 Keep in mind, you can also start translating your Wordpress site simply by entering your URL right on Bablic.com and then install the plugin once you're satisfied with your results.